JVA is now taking bookings for our 2016 interpretive training courses, workshops and seminars. All or our courses are based on years of experience in actually doing the projects/activities we do the training in. We teach what we do, and do what we teach. We award CEU (Continuing Educaton Units) for all of our courses over 4 hours in length (1 hour of CEU credit for 10 hours of classroom time or equivelent). All courses are customized for your specific outcomes (objectives), and we include pre and post test evaluations for all of our training if desired. We are one of the only firms providing interpretive training staffed by interpretive professionals with university degrees in interpretation and university experience teaching interpretive courses. Our new book on training interpretive trainers (left) and Professor John Veverka providing a training session for a Korea Interpretation Workshop. JV is also a NAI Certified Interpretive Trainer and Certified Interpretive planner.
" Introduction to interpretation for the 21st Century. taught this course for the US Army Corps of Engineers.
" Interpretive concept and message planning for museum interpretation.
" Planning cultural needs for international visitors into your tours and programs.
" Heritage tourism planning, design, feasibility and operations.
" Developing Marketing Plans for Interpretive/Heritage Sites.
" Interpretive planning for the coach market.
" New Technologies for Interpretive Services (iPhones, QR Codes).
" Interpretive Master Planning (developing your draft plan in the course).
" Innovations in Interpretive Planning (IP II) - Mass Customization, Experiential Planning, Markets of One. This is an advanced Interpretive Master Planning course.
" Planning and conducting scientifically valid visitor surveys for interpretive/heritage sites.
" Evaluation strategies for interpretive programs and services. Journal of Interpretation with implications for implementing the research results.
" Planning Interpretive Exhibitions that are theme and outcome based.
" Planning/design of interpretive publications, brochures.
" Interpretive text writing that provokes, relates, and reveals.
" Planning, design and interpretation for self-guiding trails and forest/park walks.
" Community interpretation - planning for collective experiences.
" Regional Interpretive Systems Planning and Interpretive Zone development.
" Financial Planning for Interpretive Sites and Attractions (cost/contact & cost benefit analysis). generate re-visits based on the psychology of the learner). descriptions, board of directors, cash flow, etc. for the next millennium).
" Interpretive planning and managing living history sites and programs.
" Interpretive planning and audience management in historic homes and museums.
" Teaching interpretation to others and Interpretive Coaching (Train the trainer's course).
" Developing, recruiting and managing successful volunteer programs (how do you fire a volunteer?).
" Developing Request for Proposals and contracting interpretive services. - US Army Corps of Engineers - Interpretive Services Course (3 sessions, 3 ½ days each). 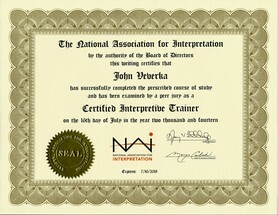 interpretation - ask for the course schedule - 4 days). - Interpretive Master Planning (4 days). topics in National Parks - Workshop held in Slovenia. interpretive systems planning for Interpretive Systems Planning. services and injecting living history interpretation into their historic property live interpretation. interpretive training program for staff and exhibit planners. * Developed detailed lesson plans. * Developed a workbook for each course (some in progress). basics and interpretive planning for Cape May National Wildlife Refuge. 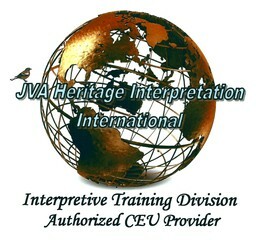 Why select JVA for your interpretive training needs?
" 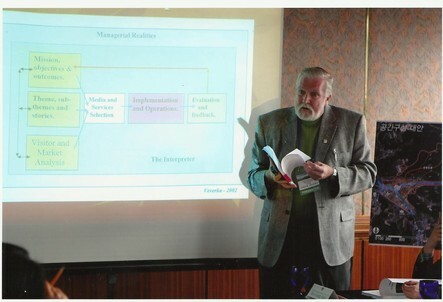 Author of the college textbook "Interpretive Master Planning".
" 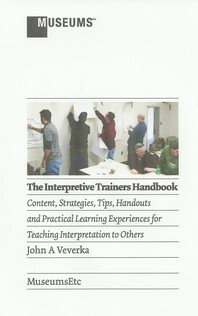 Author of "The Interpretive Trainers Handbook". University Heritage Tourism Institute, Snowdonia National Park Training Center - Wales, UK (currently).
" Completion of the National Park Service "Interpretive Coaching" training program.
" 30 years of dedicated experience doing interpretive planning and training. - Photo/reproduction ready master copies of all handouts, workbooks and CD's. - Detailed schedule of instructions (and lesson plans if needed). - Teaching aides and power point program copies. - 30 years of doing the very things we teach, with current case studies and examples. - Option for participants to purchase text books. - Meeting room and all logistical support for participants. - Copying of handout materials. - Coffee break coffee/tea snacks and water. - Participant list so we can prepare the course certificates. $800.00/day of training plus pre-paid travel expenses. This will be the most cost effective training for interpretive staff available today. College level training by master interpreters with real-world experience. E-mail or call for details, special course requirements, course size issues or any other questions you may have. We can also custom design any interpretive course topics/training needs.